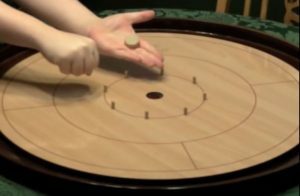 Crokinole is a dexterity game that can be played for fun but also competitively. 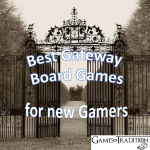 Crokinole is a very popular board game in Canada and America since the late Victorian period. As for today, the tiny town of Tavistock (3000 souls), Ontario, Canada, holds the World Crokinole Championship every year in June for the last 19 years. While it is a rather simple game, everyone can play and understand the simple rules in minutes, you will need a lifetime to develop your strategy and become good enough to master it. 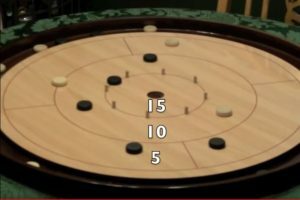 What is the goal of Crokinole? 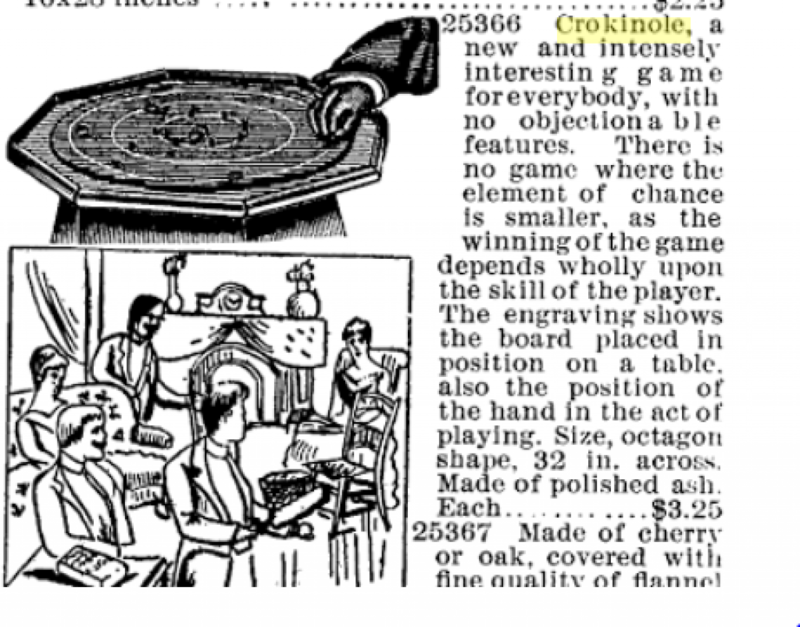 How many players can play Crokinole? Who start playing first in Crokinole? 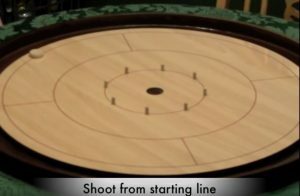 How to shoot in Crokinole? The first Crokinole board was made in the province of Ontario, Canada by a farmer and woodworker called Eckhardt Wettlaufer, who crafted the board for his son Adam fifth birthday, in 1876. 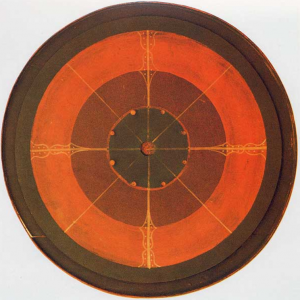 The three circles are painted on the surface and it is decorated with four stylized tulips dividing the board into quadrants; each of those quadrants is further divided by painted lines converging at the centre hole. That Crokinole board can still be seen today in the Kitchener’s Joseph Schneider Haus Museum, a national historic site. 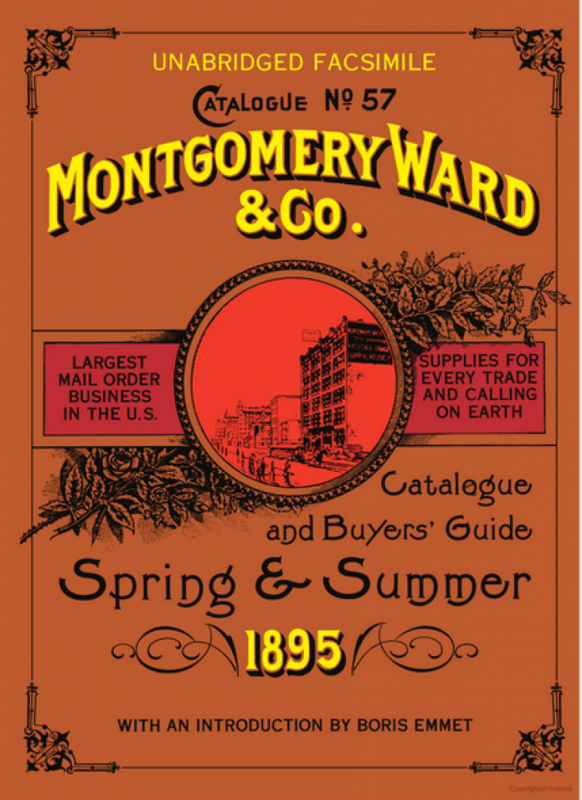 The game of Crokinole was distributed in the US from 1880 by Sears-Roebuck, Montgomery Ward & Co. You can see below an example of the Montgomery Ward Catalogue dated from 1895 where Crokinole was described as a new and intensely interesting game for everybody, with no objectionable features. 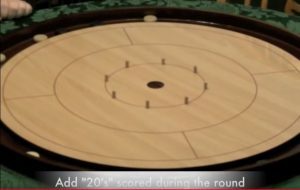 The aim of Crokinole is to be the first player to reach 100 points. Points are scored when players, who are firmly holding the end of their index or middle finger against the thumb, flick their disks as near to the central hole as possible. 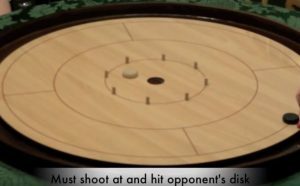 The added twist that makes Crokinole so great is that you must try to knock you opponent disk further away or in the ditch. In other words, you must try to dispose you opponents disks while keeping your own disk in the high scoring position. If you don’t touch your opponent disk, you disk get removed from the board. 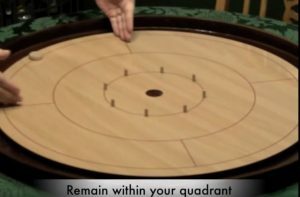 The Crokinole board is divided into sections. A disk landing in the center hole will score 20 points. This is the target hole. The next circle ring is worth 15 points and surrounded by 8 wooden pegs. Note that if a disk is resting on the line, it will be scored as being in the lower scoring ring. The ditch is where you put the disks that are removed from the game. The board is also divided in 4 shooting quadrants. 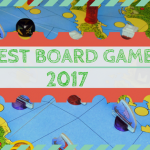 In a 2 players game, the players oppose each other sitting across the board from each other. In a four players game of Crokinole, players play in team of 2, as partners. Each team members are sitting across of each other. Each team members receive 6 disks of the same color. Then that player will hold his closed fists in front of him. One member of the other team chose a hand. What ever color disk was chosen will start the game. he game proceed the in clockwise fashion, the player to the left of the previous shooter will play next. 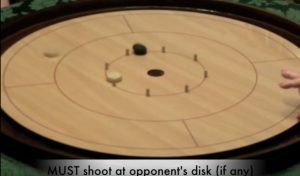 Other players must keep their hands and disk off the board unless it is their turn to shot. When a player is shooting , at least one portion of his or her posterior must touch the chair.This is also known as the “On cheek Rule”. The four legs of the chair must also touch the floor. Players will shoot by placing their disk on the shooting line in their shooting quadrant. When there is no opponents disk on the board, like for the opening shot of the game, the player might attempt to aim for the 20-point hole. If the player manage to shot his disk inside the 20-point hole, the disk is removed from play and set aside to count as 20 points at the end of the game. Any shot made without any opponents disks on the board, must land within or touching the 15 points circle. 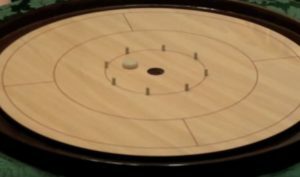 Note that some regional rules might differ on that specific point but this is the way Crokinole is played during the World Crokinole Championship. If it doesn’t, the disk, and all disk contacted, are removed from play and put in the ditch. The shooter’s disk must strike his opponents disk either directly of by bumping one of his or her disk. If no opponents disk are contacted, the shooter’s disk and every of his own disks it touched, are removed from play. This will considered as an invalid shot. Caroms shot: It is allowed to bounce off a post or other disc. In a caroms shot, if the opponents disc is not touched, both the played disc and any of the shooter’s same colour discs that have been moved, will be removed from the game and placed in the ditch. Combination shots are also allowed: It means that you are allowed to hit your disk first and then an opponent disk. A variant that I personally like is that you MUST hit an opponents’ disk first, and that if you miss and touch your own disk first and then the opponent’s disk, then all of your own disks that were hit are removed. If a disk touch the outside line (shooting line) , it will be ditched. Note one exception: The ‘spinning disk rule that says that if a disk stays on the board crossing or touching the start line but is still spinning and comes to rest inside the start line, it counts as a valid disk and is not removed to the ditch. 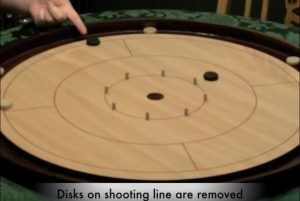 The scoring occurs at the end of a Crokinole round, when all the 24 discs have been shot by the players. A disk landing in the outer circle scores 5 points. Remember that if a disk is resting on the line, it will be scored as being in the lower scoring ring. The players add up their points and the player with the higher score receives the differential. 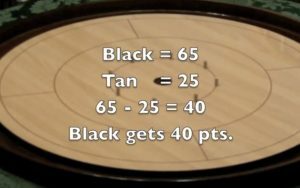 So if the Black have 65 points, and the Tan 25 points, the winner is the Black and Black gets 65-25=40 points. What is the game Go?